Google Earth view of the Games field with the Isle of Mull in the background. Click on it for a larger view. 2011 GAMES CANCELLED due to lack of an alternative field. Our usual games field was ploughed last year, we had booked Mossfield Park in Oban but as the field was having new drainage put in and the same was happening to the other available venues. The Committee would like to apologise for this and extend an invitation to the 2012 games. Watch for news early next year. Downloadable Dance and Piping forms on Google Docs added. A traditional Highland games with a full programme of field events such as athletics, heavy events, high jump, hammer, shot putt, weight over the bar, caber tossing, tug 'o war, tossing the sheaf, long jump, pillow fight, highland dancing, piping, children's races and novelty events for all ages, haggis hurling, wellie boot throwing. Side shows, refreshments, dog show and displays. See the What Has Been On page. Adults - £6.00; Children and Concessions - £3.00; Family and full vehicle discounts available at the gate. If any coach parties intend coming, please get in touch first. Access to parking is restricted and cheaper rates apply. Our gratitude goes to Mr & Mrs Hugh Whittle for their continuing support in allowing us to use the field over the years. 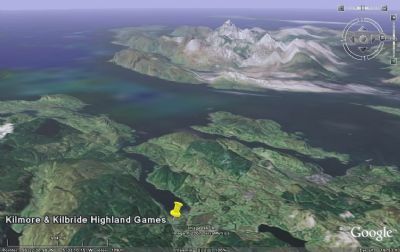 The 2010 games will be on Saturday the 31st of July in the grounds of Glenfeochan House, Kilmore, which is about five miles south of Oban in Argyll. The Games start at 11am and finish around 5pm. Follow us on Twitter for the very latest news. Getting To The Games By Bus, etc. To and from Oban and Ellenabeich/Cuan Sound 418 Route map. To and from Oban and Lochgilphead 423 Route map. All Oban routes and Route maps.